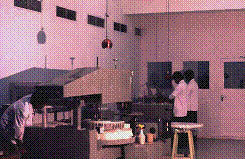 At Indian Institute of Astrophysics, Optical Fabrication dates back to the year 1964 with hand working of optical components in one of the rooms attached to the solar tower in Kodaikanal. 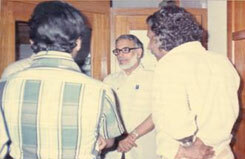 At the initiative of Late Prof.M.K.V.Bappu, the then Director, Mr..A.P.Jayarajan set up the optical workshop. 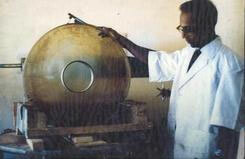 Mirrors up to the size 15 inches were being worked by hand till the first machine capable of handling mirrors up to 30 inches in diameter was fabricated at Kodaikanal workshop. 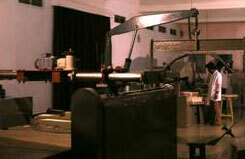 This machine, since operational, has been used for the fabrication of first 20 inch sphere which is now the camera for the Coude spectrograph on 40 inch telescope. 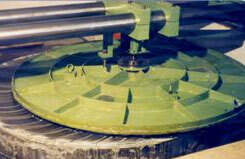 Later two 25 inches paraboloid for NAL and some other 24 inch and 30 inch optics were fabricated. 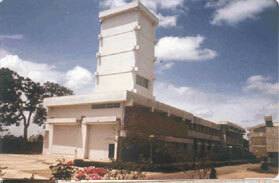 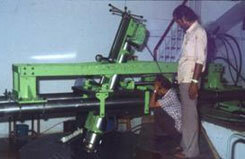 The year 1976 had brought a major addition in the facility of the Optical Workshop at Bangalore. 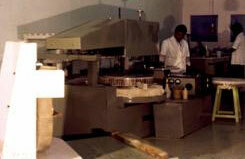 A machine capable of handling mirrors up to 100 inches was commissioned in the same building in the year 1979, where an in-situ testing in a 25M high vertical tower is possible. 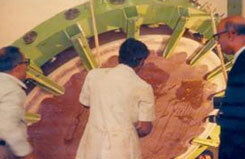 The complete workshop is air conditioned for better controlled working of optical polishing and figuring. 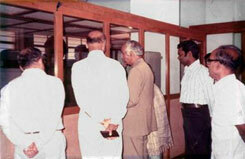 Nobel Laurate Prof. S. Chandrasekar visiting Photonics Lab and Prof. M. K. V. Bappu explaining.